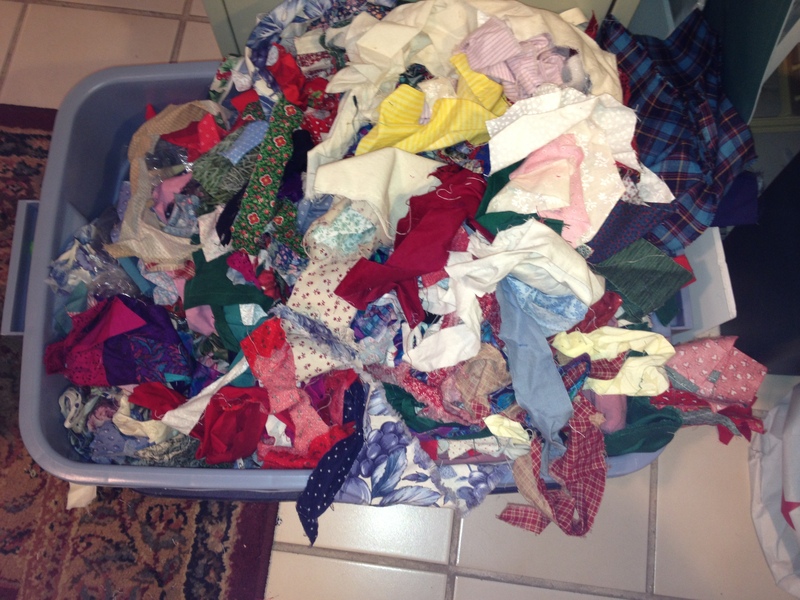 I have scraps, lots and lots of scraps….I have told you about my scraps in previous posts. 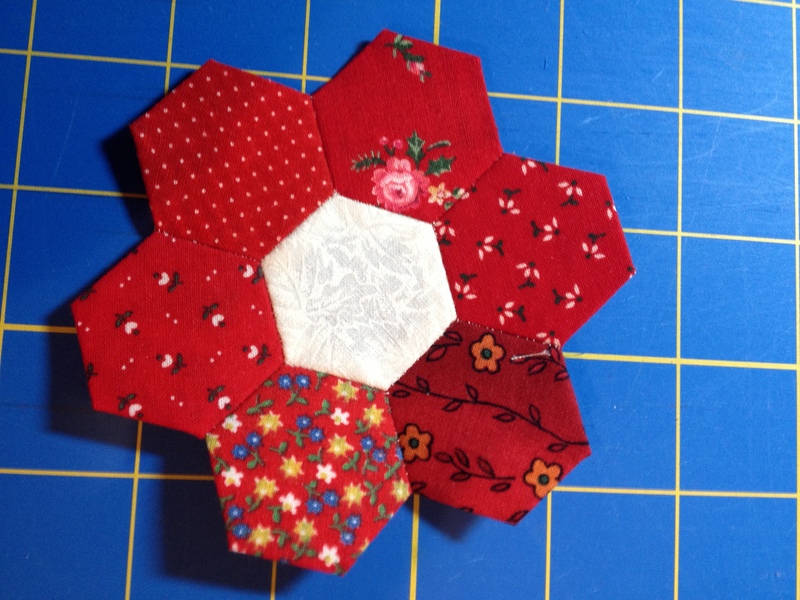 One of my scrappy projects is to make a Hexie Quilt. I am using the technique called English Paper Piecing. 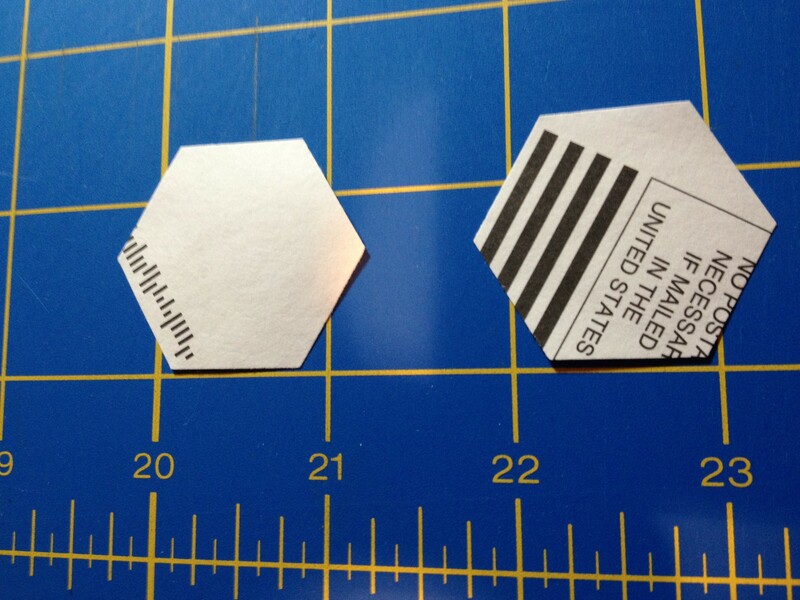 I cut my hexagon out with a paper punch. The outer edge of the larger punch is 1 1/2″ long, I use the little cards that we find in magazines – the ones we hate, that fall all over the floor when we open a new magazine. 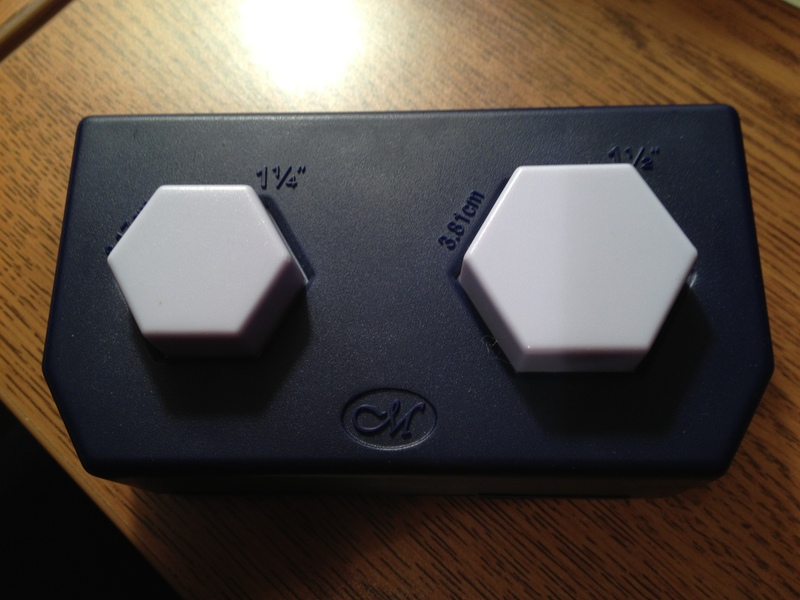 Hey they are free and the perfect weight for this project. I have a folder full of these cards – one more stash of stuff. 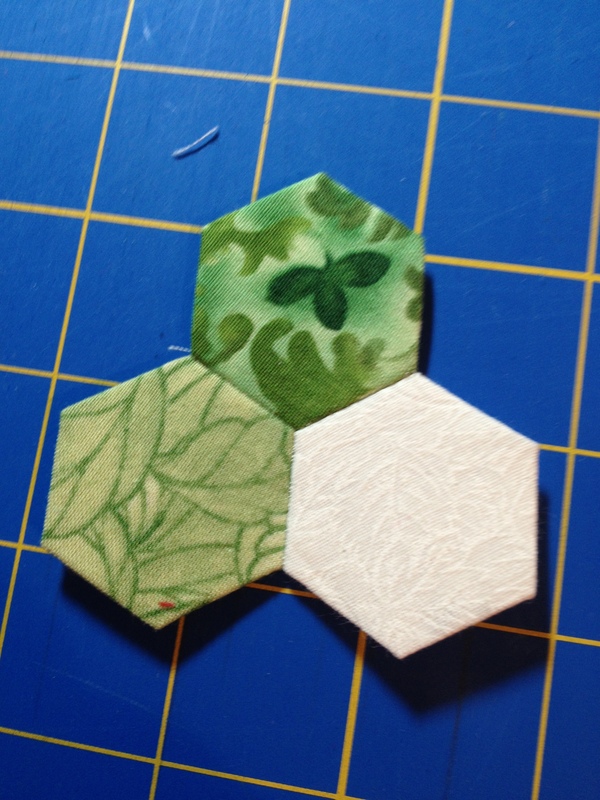 I use my Go Cutter with a Hexagon die to cut the scraps into the size and shape that I need. 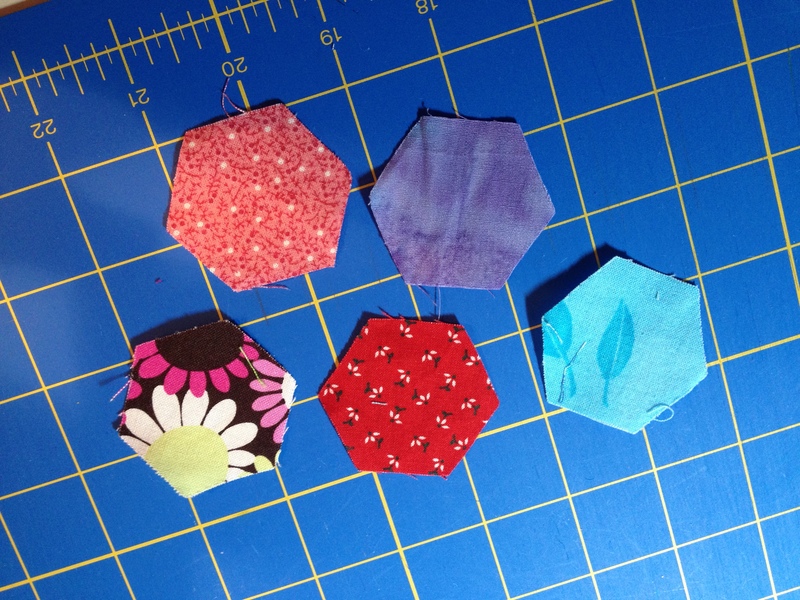 I pin the fabric to the cut-out hexagon and use a running stitch around the outside to hold it in place. 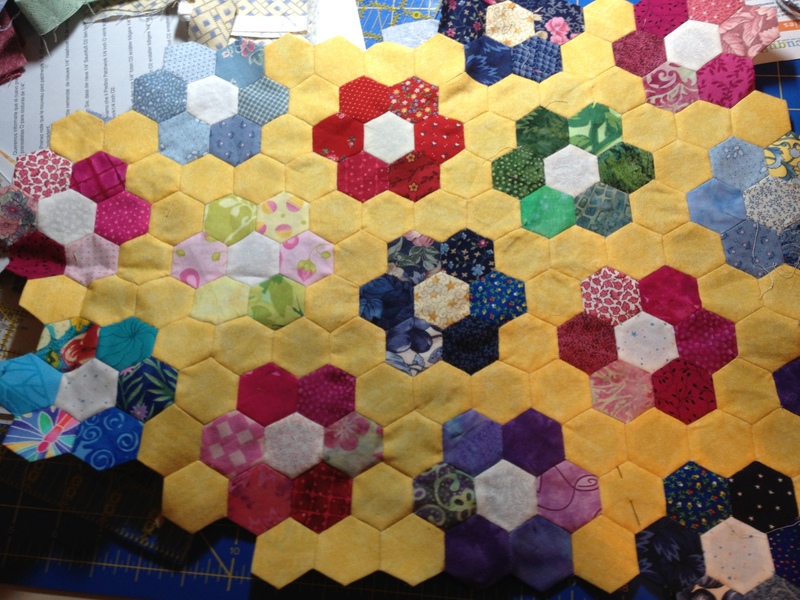 I do not stitch through the paper because I am going to remove it after all of the hexies are attached to each other. After I have a bunch of them basted I start to group them but color and sew them together. There are several different stages to making these little “flowers” so I am never bored. I have had one of these red fabrics for 30 years! It is the perfect mindless project to do on a car ride, or air plane ride or while watching TV when you are too tired to really think about sewing. One thing that I have noticed about quilters is that they never want their hands to be idle. If we are sitting, we are stitching. I realize that this quilt (whatever size it turns out to be) will take me years. There is no time limit on it, it is “busy work” but eventually it will be something that is totally made by my hands – no sewing machine. Every tiny little stitch made by hand. An age old craft still being done in spite of all of the amazing technology available to us. Don’t get me wrong I absolutely love the technology that we have – I use it all the time – the internet has brought so many quilters together in so many different ways. I use a computer to design blocks and quilts and I love it, but doing things totally with my hands is really fun. I really have a sense of accomplishment when I do hand work. That is how I learned 30 some years ago because I didn’t have a sewing machine but I wanted to make quilts. It is relaxing. 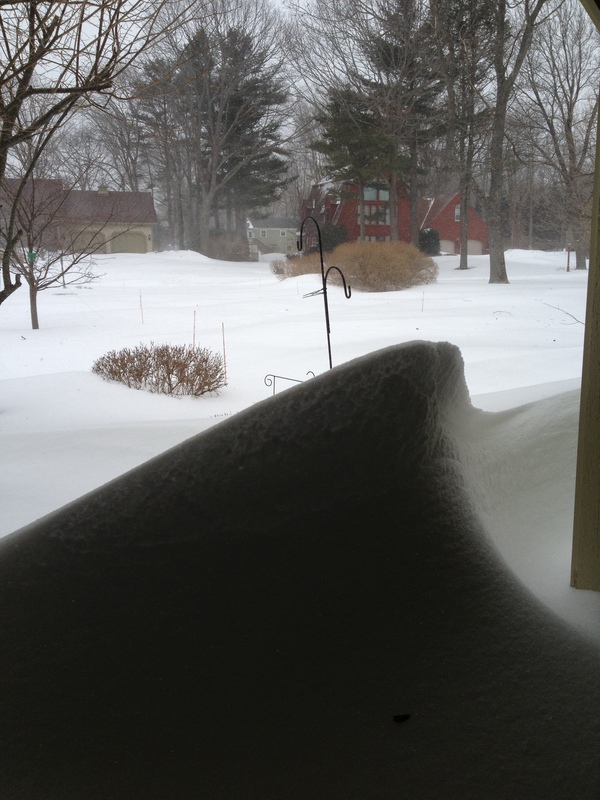 Hope you aren’t getting to buried in the snow – it has just turned to snow here on the coast- it had been raining all day. 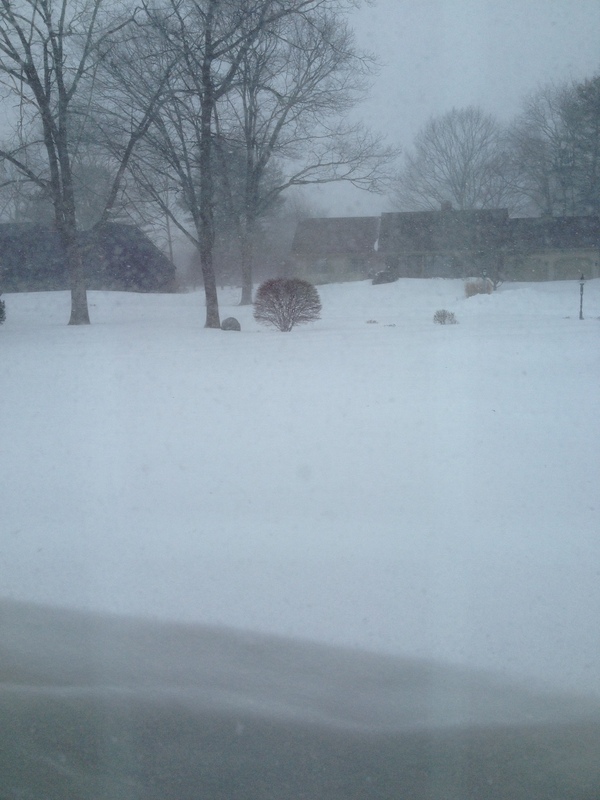 To the west of the Maine Turnpike it has been snowing all day. Drive carefully. Happy Valentine’s Day to all of my valentine’s. I used to love Valentine’s Day when I was little. We would dig into our mother’s package of paper doilies and pull out all of the pink and red construction paper and decorate our shoe boxes. We would cut out hearts with our little silver child safe scissors and glue all of the hearts and doilies to the shoe box that we had saved from the start of school (when we got our new shoes). We would have our mother slice a slit in the top so that all of our classmates could give us a valentine. There was always a party with fruit punch and cupcakes decorated with pink frosting with sprinkles. I remember Valentine’s Day being one of my favorite school days. I am sure that this would all be politically incorrect these days and children are probably not allowed to participate in a party like this lest someone’s feeling will be hurt. So sad that the powers that be can’t let children just be children any more. 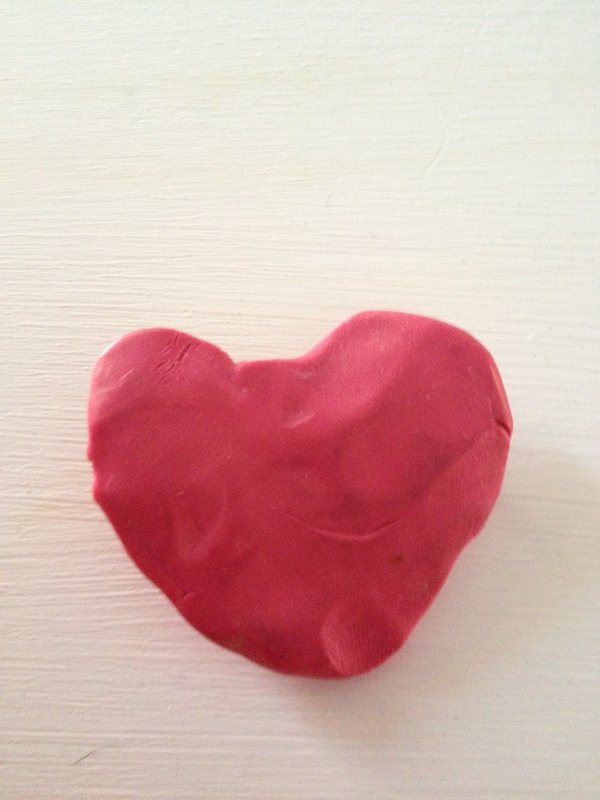 Years ago my darling daughter made me this lovely little heart pin. I still wear it every year on Valentine’s Day. I am wearing it now. Especially handmade by Elizabeth for her Mom. 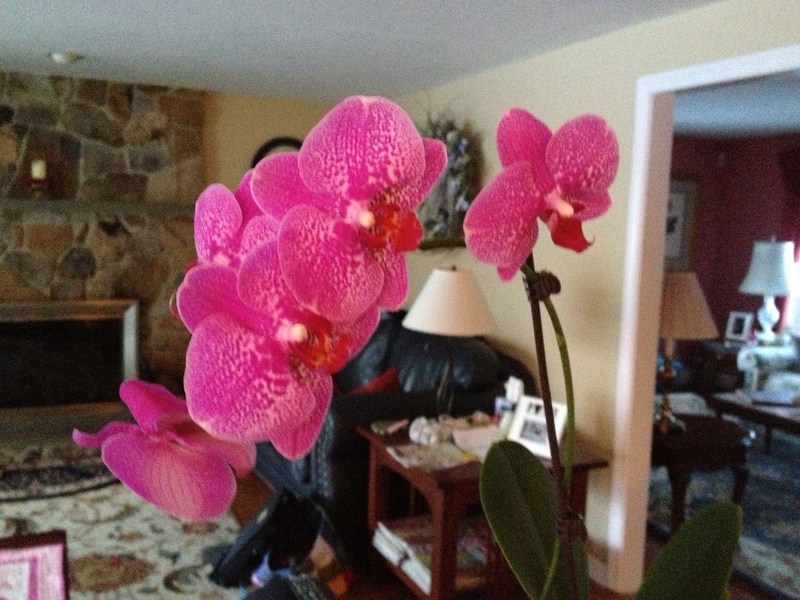 My Valentine gave me this lovely orchid for Valentine’s Day. I have several other Orchids in various stages on bloom. One that my children gave me is blooming for the third time. They are amazingly easy to care for and so beautiful to have in my home. For those of you who don’t realize it today is also Ferris Wheel Day. I always loved the Ferris Wheel when I went to a fair or carnival. I especially loved it when it would stop at the top and you could look out over the entire fair. So have a very happy Valentine’s day and try to remember the last time you were on a Ferris Wheel – maybe it was with your special Valentine. 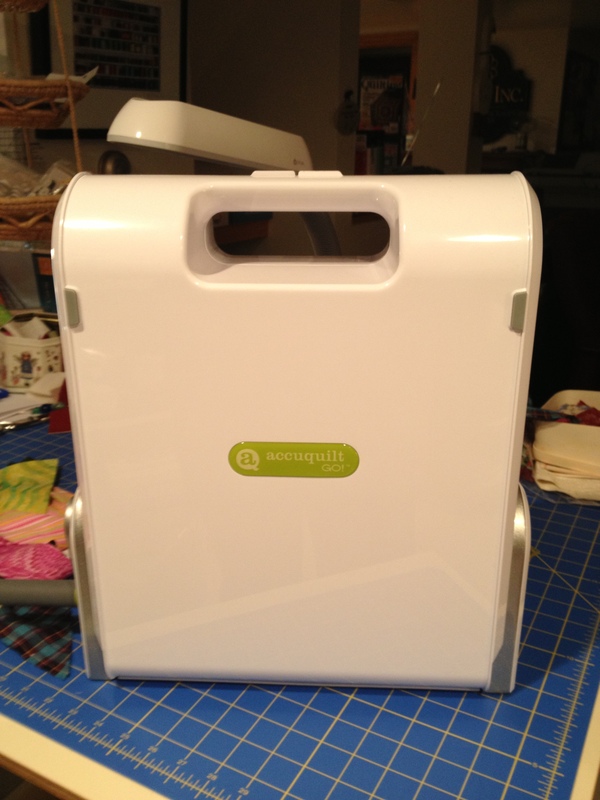 So, the beginning of the oops started with purchasing a new sewing machine last week. My goal over the weekend was to totally straighten up all of my scraps so that I could sew, sew, sew with no guilt. 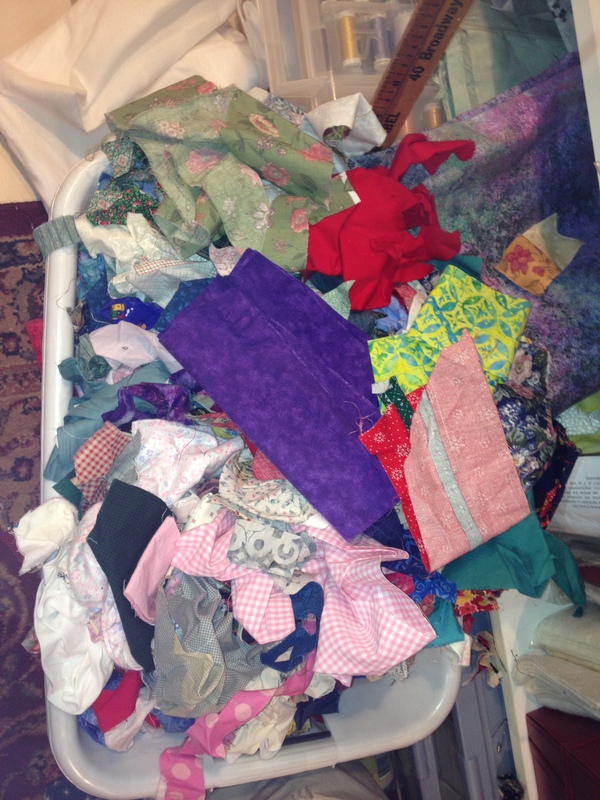 As I was pulling scraps out of the many containers of scraps I started to remember – “Oh I made Elizabeth a jumpsuit out of that fabric”, “I used this in the quilts that I made when we were furnishing our first condo in Maine”, the list goes on and on. I was getting nostalgic, so of course I needed to sew. 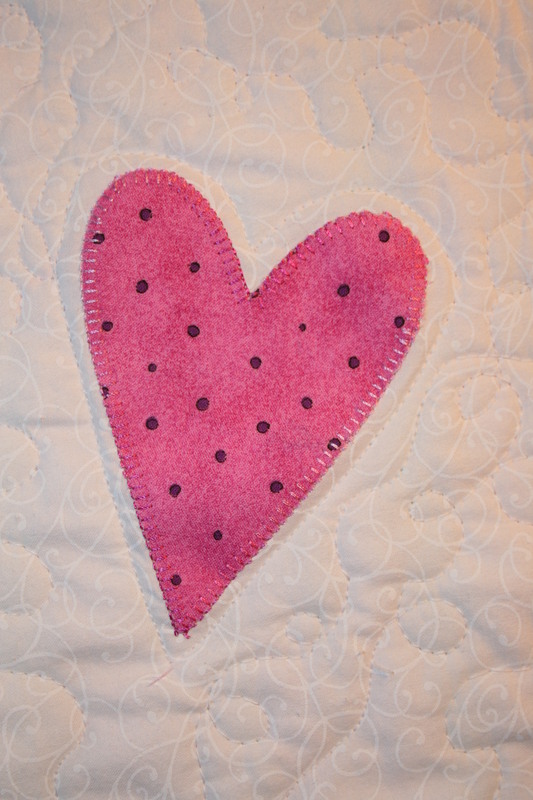 I pulled out my Accuquilt Go http://www.accuquilt.com/ and started to cut different shaped hearts. I was using my scraps. No yardage was cut in the making of these table runners. I happened to take a quick picture of my work in progress to send to Elizabeth –she of course loved it so I offered to make one for her as well. I worked on these all weekend – finishing the last stitch just as the Super Bowl was ending. 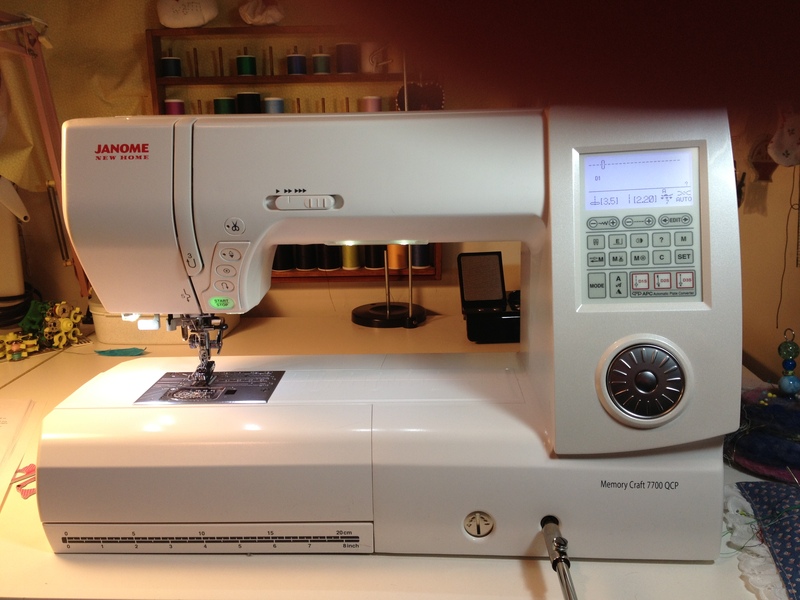 Back to the new sewing machine, I purchased a new Janome Memory Craft 7700 QCP http://janome.com/. Don’t get me wrong, I love my vintage machines and I will continue to use them but this new machine is a gem. My old Bernina 1230 is still chugging along and doing well but it has a very narrow throat 6”, very difficult to put a quilt through that narrow space. The new machine has an 11” throat. Wonderful! 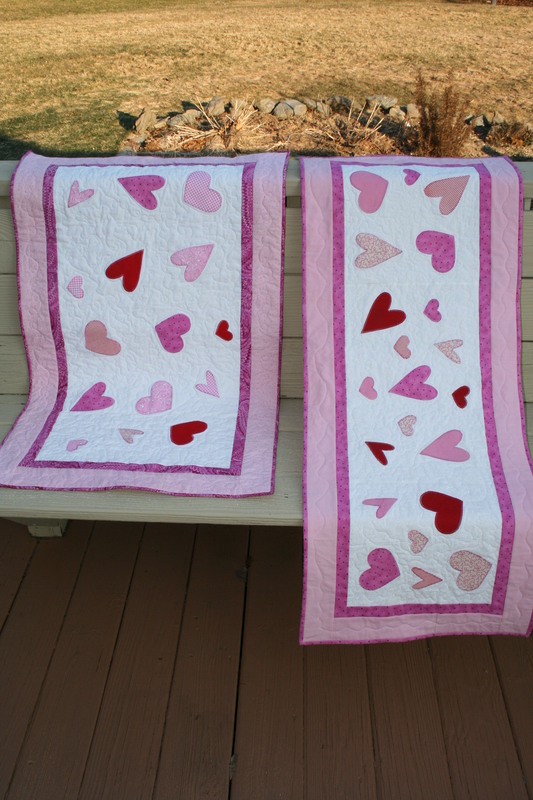 It also has many other features that make quilting a larger quilt much easier. It is really the reason that I bought the machine. So I had to give these new features a try. What fun I had and these 2 table runners are the first of many projects that this machine will help me create. 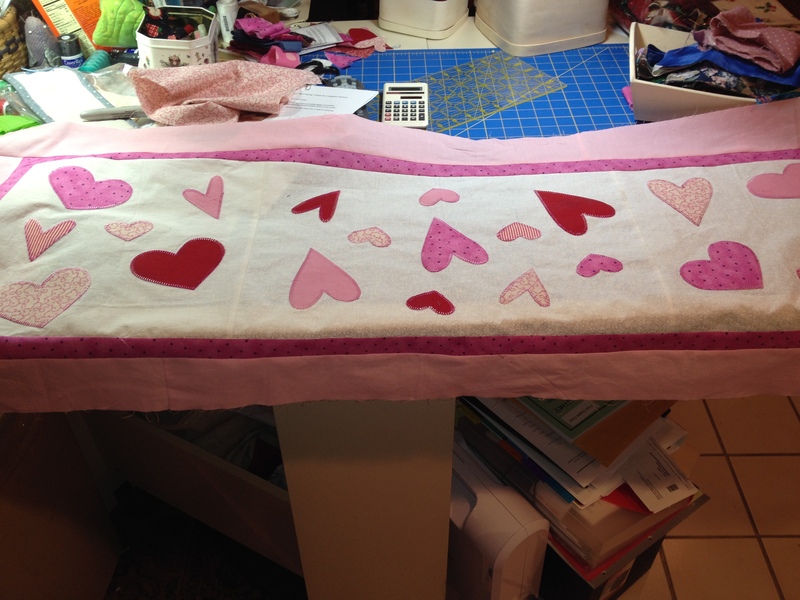 I used an applique buttonhole stitch to sew the hearts on and the free motion quilting feature to quilt the runners. I will not win any awards for these pieces but there is a learning curve and these are sort of my practice runs. 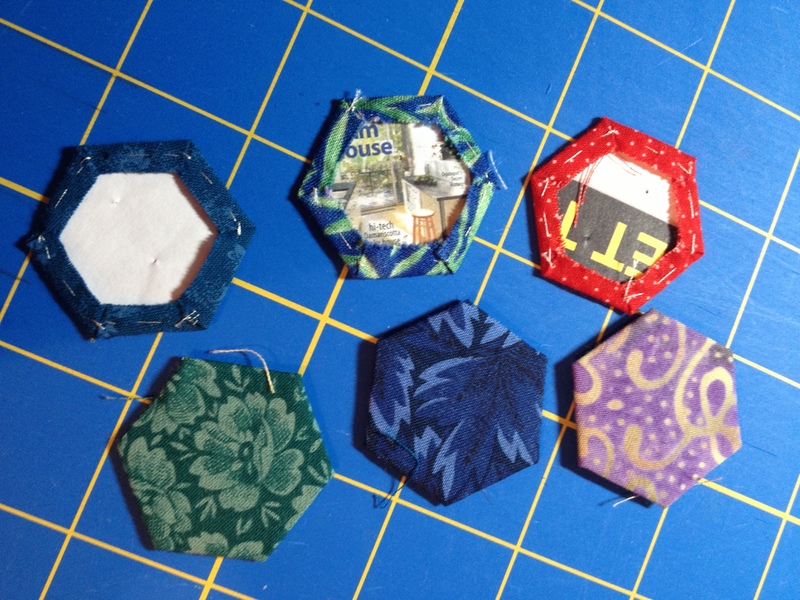 I thought why use a bunch of scraps and thread to just practice – why not make something? Of course I still have 3 baskets full of scraps and my closet still needs to be straightened out but I had a great time making these. So I will continue to sort scraps and straighten closets until another creative surge hits and then I will stop and sew, sew, sew. So I would classify myself as a pretty big football fan. 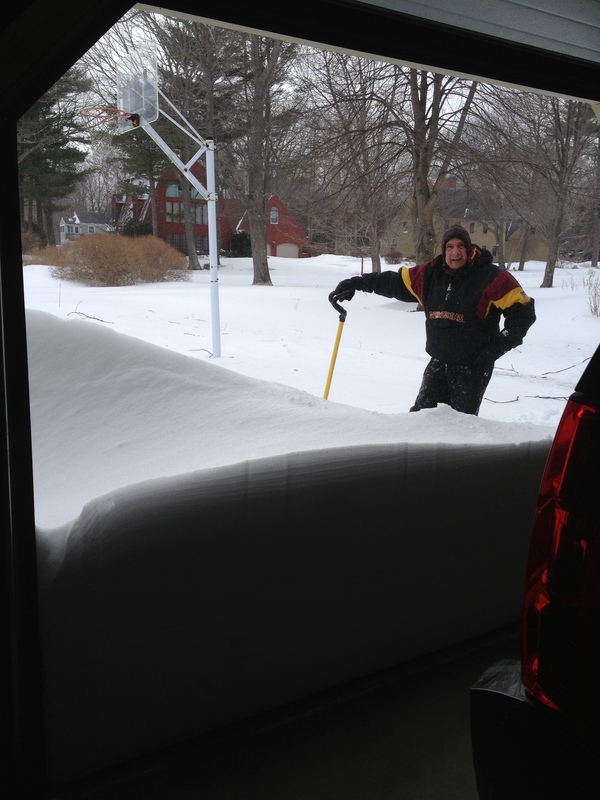 I usually am very excited about the Super Bowl games but this year not so much. 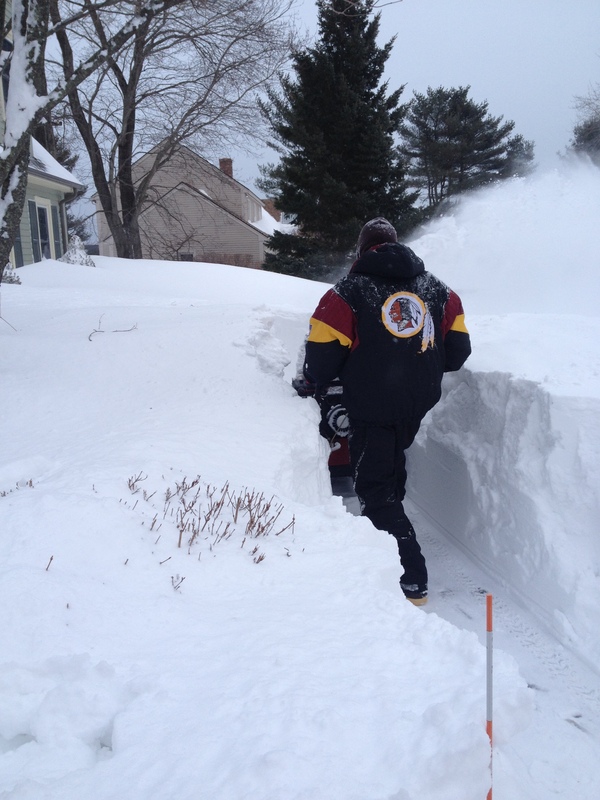 I won’t get into all of the reasons why I don’t want the Ravens to win or the reasons why I do want the 49ers to win but I will not be glued to the TV all day on Sunday waiting for the “Big Game” to begin. Instead I will be sorting. I have way more bins of fabric than I have room to store them. I am going to sort through the scraps that I have been saving for close to 25 years and slice and dice until I have nice neat piles of strips and bricks of fabrics. I know that this project will be a walk to memory lane. I can see just by looking at the fabrics in the baskets that there are fabrics from quilts that I made when my children were babies. 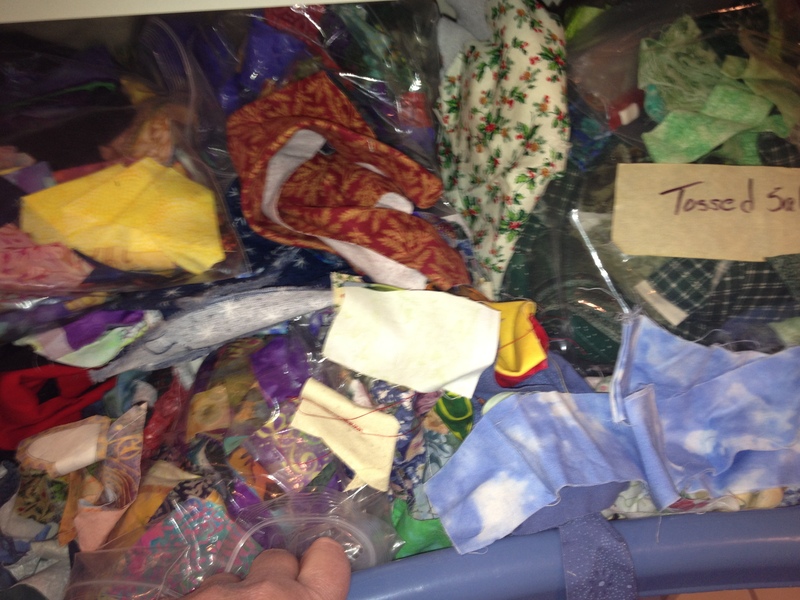 Many of these scraps of fabrics are from clothes that I made for both of them over the years. It will be a lot of fun to look at all of these fabrics but what will be even more fun will be the bags of fabric that are ready to be made into new quilts. No $ spent and laundry baskets of jumbles of fabric emptied. How great is that! 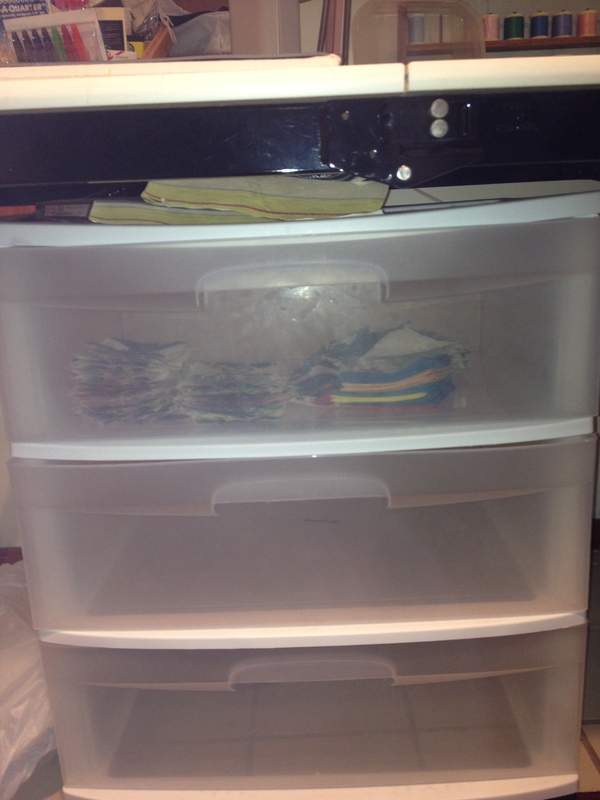 I have a storage container with 3 drawers in it that fits very nicely under my sewing table and a box of 2 gallon zip lock bags ready to be filled with slices of fabric. 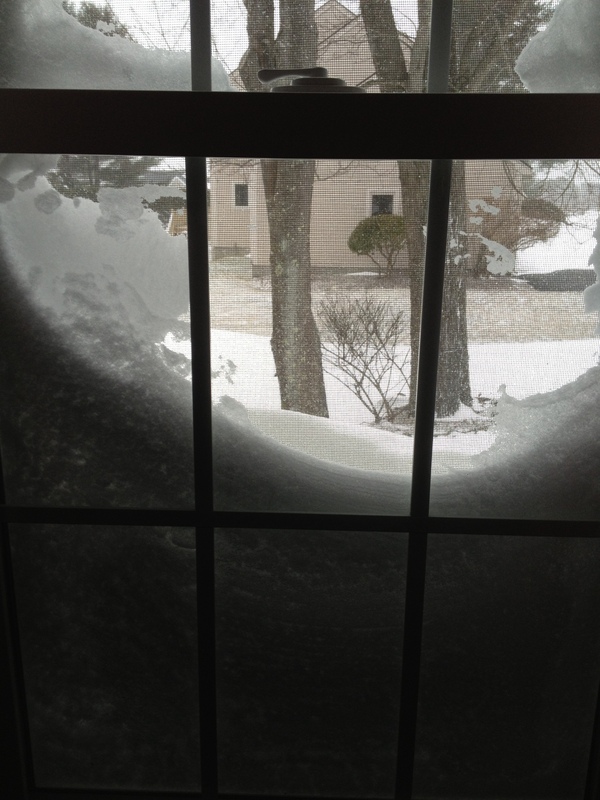 My plan is to cut 3 ½”, 2 ½” and 1 ½” strips when I can. 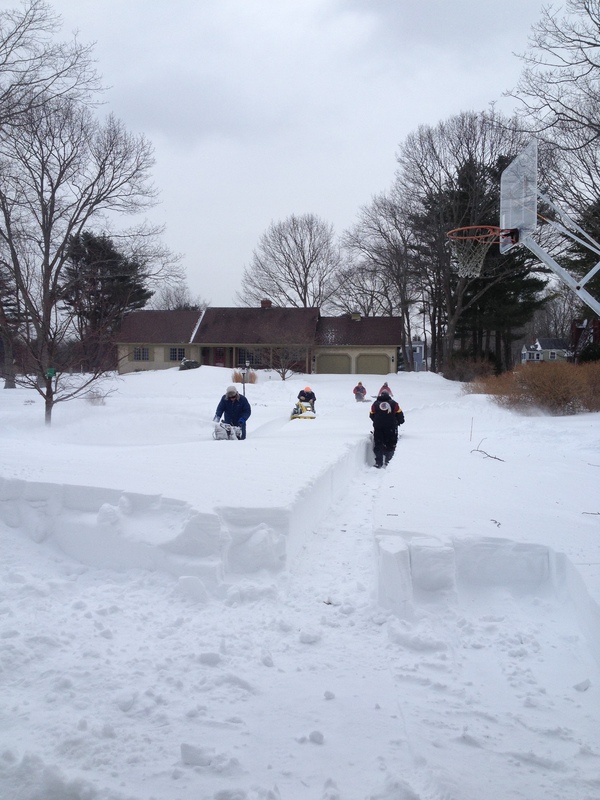 I am going to cut 1 ½”, 2 ½” squares, 5” blocks. I am going to cut a variety of bricks 2 ½” x 3 ½”, 2 ½” x 4 ½”, 3 ½” x 4 ½” and possibly 4 ½” x 6 ½”. These are all sizes of fabrics that can be combined easily with strips to use in quilt tops. I will then sort them by colors, not to fussy but general sorting. I am looking forward to getting all of this organized. I have been trying to use more of my scraps lately just to add some zip to my quilts and to also use up fabrics that have been sitting around for years. If I have an organized way to get at the scraps it will make my job that much easier. All of this organizing has been inspired by Bonnie Hunter – you can see Bonnie’s tips on this here – http://quiltville.blogspot.com/2005/06/scrap-users-system.html. Check it out – she has loads of clever ways to get your scraps controlled. I am really excited about this. Ok call me crazy for being excited about something as mundane as sorting and cutting fabrics, but I know that in the end the reward will be great! So wish me luck and I will show you the results when I am done. Enjoy the weekend and the game. Remember to do everything in moderation, eating and drinking.